So this year, McDonald's let people pre-order its new Hello Toys collection online to prevent the chaotic queues of previous years. But to give myself a challenge and a purpose in life, I decided to try and collect all six Hello Kitty Bubbly World toys by getting each toy at a McDonald's outlet as it is released one at a time each week. Although there were no queues in the first week, I remember how last year, the queues started forming only in the final weeks of the promotion. True enough, at the start of the second week of this year's promotion, Stomp published a report that the queues were back. But that turned out to be a false alarm. 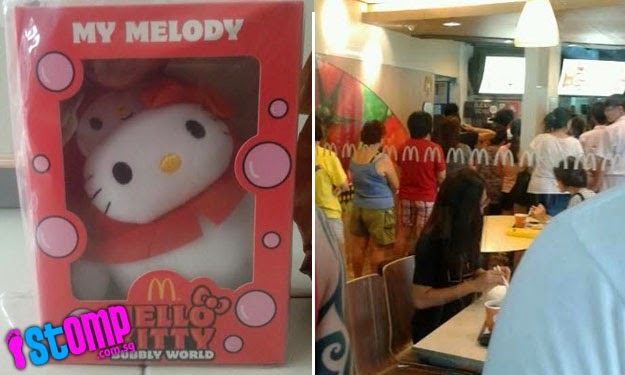 When I bought my second Bubbly World Hello Kitty at the McDonald's Yew Tee outlet, there was no queue. There were also no queues for the next two Hello Kittys. But when my wife went to buy the fifth toy for me, she had to queue, though not for very long. That got me worried. Was it going to be a repeat of last year with queues in the last two weeks? Coincidentally or not, like last year, the final Hello Kitty toy for this year is also black. If I fail to get that final Hello Kitty toy to complete my collection, all my efforts would be for nothing. My life would be meaningless. Fortunately, I got the black Hello Kitty yesterday with no problem. My collection is complete. Life is worth living again.